I love basketball and couldn’t be more thrilled that we are having a NBA season. I was starting to get weirdly excited about the shenanigans that NBA players were about to get involved in. I love seeing these guys act like themselves (teenage boys who have the house to themselves for the weekend, know their parents’ credit card number, have the keys to the Volvo, and are well versed in the workings of the liquor cabinet and the freeze-pop drawer), and this lockout was about to bring out the best/worst in all of them. Every single one. A few weeks ago, at the height of my belief that a season was out of the question, I started to make a list of things I was pumped for in the upcoming locked-out months. There are 25 things. Yep. Thirteen, and then 12 more. 25. Stephen Jackson’s second worldwide no. 1 single. 24. An “Ebony and Ivory” cover by Billy Hunter and David Stern. 23. Baron Davis’ full transformation into Tunde Adebimpe from TV On The Radio. 21. 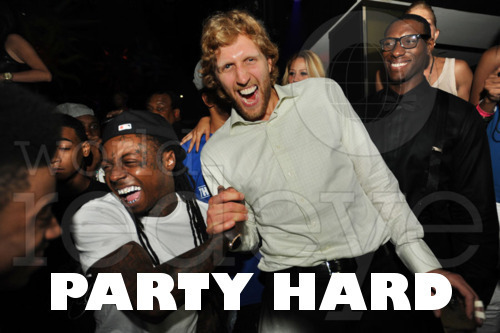 Drunker Steve Nash. Everywhere. 20. 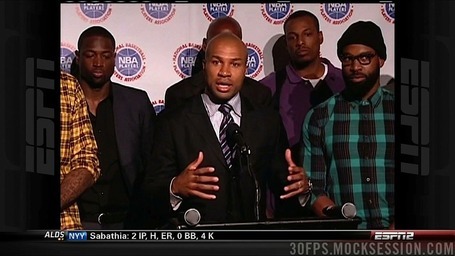 Season 1 of Basketball Husbands on VH1, starring Shelden Williams. 19. Continued evidence that Derek Fisher is the only player who took a class in college. 18. Warehouse parties in Brooklyn, hosted by Kevin Durant and Russell Westbrook. 17. The Chris Paul family on Family Feud again, but this time against Shawn Kemp’s five youngest kids from the contiguous 48. 16. A new form of currency, with Joe Johnson’s face on all paper money, coins, and IOUs. 15. Stephen Jackson’s first album, on Rick Ross’ Maybach Music Group imprint. 14. The daily Metta World Peace podcast. Cohosted with his alter ego, Ron Artest. 13. A LeBron-DWade sext tape. 12. Season 1 of Lockout Divorcees on VH1, starring hundreds of women. 11. Amar’e Stoudemire’s monthly “Big and Tall and Black and Jewish” column in Vogue. 10. Tracking Delonte West’s march up the corporate ladder at Regency Furniture Showrooms. 9. A rumor about Delonte West and the CEO of Regency Furniture’s mom. 8. A jobless Delonte West. 7. Televised third grade basketball games, with NBA players as coaches/concerned dads. 6. Openly paying UConn’s Jeremy Lamb by the basket. 5. Lockout Boyz, a straight-to-VHS courtroom thriller starring Steven Seagal and Stephen Jackson as opposing lawyers, with Chris Broussard as the bailiff. 4. Not seeing Ricky Rubio play basketball. 3. Not seeing Eddie House ever again. 2. Following only JaVale McGee on Twitter. Ones that just missed the cut: Going to/back to college, meeting family members, and giving back to the community.